I’m not on my phone a lot so I haven’t found the big benefit that many people report where the watch lets them keep their phone in their pocket more. I do find it very helpful and my use is focused on 3 specific faces. I use my watch for sleep tracking via AutoSleep. I purposely picked a face that was simple and I only add complications that render fully in the primary face color. 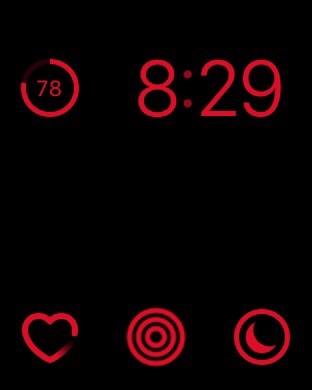 For the color I use red so that it isn’t jarring to check the time at night. 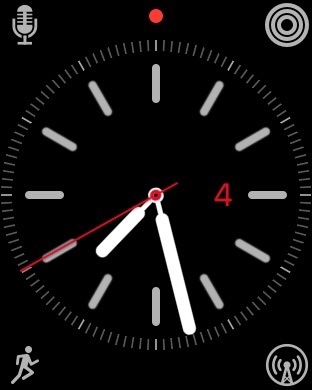 I also use Theater Mode at night so that the watch doesn’t light up if I’m tossing and turning. The main features of the watch I use at night are the Battery complication and the Time. I include the Activity and Heartrate just in case I want to check them. The AutoSleep complication is a recent addition and I’m still seeing how it fits into my usage. This is the face that I use most of the day. 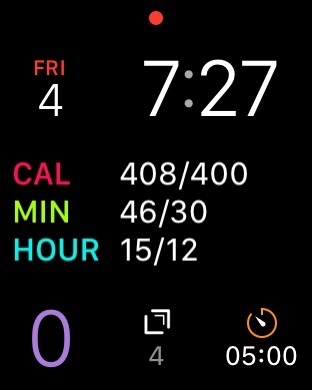 I like having the Activity info front-and-center since I try hard to close all of my rings every day. Beyond that, the Date is important since our 3 youngest kids all take turns saying grace at dinner (based on the remainder of the date divided by three – 1 is youngest, 2 is next youngest, etc). I like OmniFocus to keep me on track with my tasks, I use Drafts for the occasional capture, and the Timer is for my morning tea and oatmeal (among other things). I try to take a walk during lunch every weekday and this is the face that I use for that. The Workout complication makes it easy to start a workout and the Activity workout makes it easy to check my progress at a glance. The Overcast complication makes it easy to see where I’m at in a podcast that I am listening to. Those are great, but the real workhorse of my workout face is Just Press Record. For a long time I’ve wanted some way to easily make a note about my thoughts or an idea while walking. I often carry a notebook and a pen but it’s difficult to maintain a 4 mile/hour pace (my target) and write at the same time. Just Press Record has been fantastic because I can easily pause the podcast, switch over to JPR, dictate a note, and then unpause the podcast. Some may suggest that I could do it with Drafts but I live (and walk) in a place with very limited cell service. JPR works by recording the audio and then converts to text later on the iPhone. Overall I am very happy with my Apple Watch. The battery life is fantastic and as long as I charge it while showering and the occasional top off a few times a week I am easily able to wear it at night for sleep tracking. But I’m still hoping for a digital thermometer in the future.